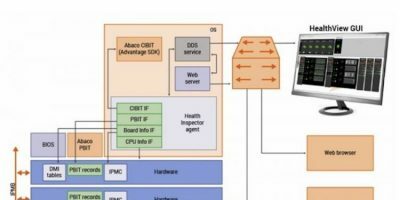 To maximise system reliability and success in mission critical environments such as electronic warfare, digital radar and flight control, Abaco Systems has introduced the Health Toolkit, a software/middleware tool that interrogates and reports on the status of all system hardware components. The Health Toolkit operates between the underlying hardware and the application software to interrogate all aspects of the hardware’s performance. It optionally reports on its health via an intuitive graphical user interface (GUI) and enables corrective measures to be taken if necessary. The Health Toolkit not only analyses and reports on Abaco VPX hardware within the system, but also enables third party and custom hardware to be integrated and interrogated. The Health Toolkit is an extension of Abaco’s NodeWare family of software. NodeWare leverages the power of data with advanced software technologies including AI, deep learning and software-defined machines, and combines these to deliver actionable insights either via a GUI or an application programming interface (API). NodeWare also includes the AXIS integrated software development tool suite and the OpenWare switch management environment. The granular data provided by the Health Toolkit can be used to identify patterns of behaviour that can lead to hardware malfunction, enabling corrective action to be taken to prevent system failure. It also reports on resource utilisation, allowing resources to be reassigned if necessary. There are three key components in the Health Toolkit. The first is the Health Monitoring Framework, with an agent application to collect and publish system health information, the Libraries and Templates components eases the integration of health monitoring directly into the end application and provide extensibility to support custom and third party hardware modules. Finally, the Health Monitor GUI provides an integrated dashboard to display all the system health information being collected and published via the framework. The core framework is built on the Data Distribution System (DDS) open standard middleware layer, which aligns with common system architecture standards such as FACE and SOSA. The toolkit provides DDS publish and subscribe example source code and a fully documented data model, which enables developers to integrate their own components into the framework. Operating system support is provided for Linux, Windows and VxWorks.